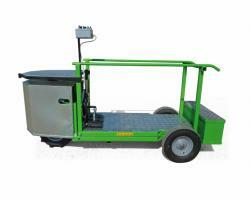 The "TUCANO" is substantially an electric traction motorized platform, that can operate with one 800W electric motor powered by one 24 V battery. 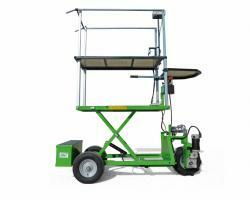 It is particulary suitable for carrying out processing in the cultivations of strawberries, tomatoes, etc..in particular in greenhouses plants, in an easier way and in complete safety for the operator. 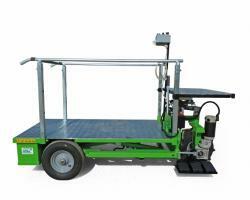 The platform, where only one operator can work, is adjustable in height to ease the use for the operator. 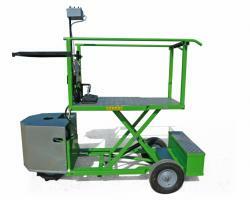 The machine is equipped with a variable-speed unit and three wheels, of which one is a front driving wheel in central position. This allows an eceptional maneuverability in front operations avoiding any damage of the nylon in the greenhouses installations. On request, the machine can also be equipped with various accessories, such as the automatic ejector with automatic change-over from electrical to manual operation. 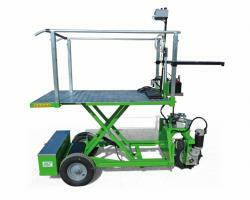 This allows the operator to work faster in the reversion maneuvers of the heads. The machine is also equipped with an automatic driving system that allows the operator to keep a linear direction without any corrections of the driving.